Total No.of posts to be fill up for 15 UPHC’s in R.R. Total no. of posts to be fill up for R.R. Dist. As per pattern. B. 18 months MPHW Female Training Certificate recognized by AP/TS Nursing & Midwife Council OR Two years Intermediate vocational MPHW Female course and have completed one year clinical training in selected Government Hospitals in which these students have been permitted to undergo clinical training OR Completed one year apprentice ship training Govt. of India. Southern Region Chennai. C. Physical Fitness for camp life. Candidates eligible for medical officer (Full time) and Medical Officer (Part time) should fill two different applications, if they are otherwise willing to be considered for both the vacancies. 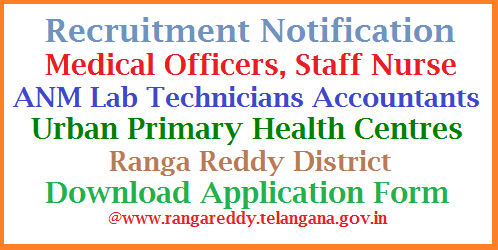 Application forms along with the instructions can be downloaded from the official website of the District Ranga Reddy www.rangareddy.telangana.gov.in at District Notifications. Study certificate for the years from 4th class to 10th class and in case of Private study residence certificate from the Tashidhar / MRO concerned.